It had been about 5 weeks since I had IPL laser procedure to remove sunspot damages and melasma. I do see improvement but I need a couple more procedures to completely remove all the spots. Anyhoo, after my treatment, I immediately started to apply La Mer Concentrate day and night for 2 weeks. According to La Mer, this concentrate helps with recovery post laser treatment and plastic surgery. My face recovered quite well. Initial discomfort from IPL disappeared after about 30 minutes. I saw dark brown spots that same evening popping up. I figured those areas were going to scab. The scent is quite pleasant and after application, I felt as if there was a thin layer of something over my face, not unpleasant though. My face felt silky to the touch. As many gal pals swore on this product, I am guessing this was money well spend. To further test if this concentrate is good for burn, I accidentally burn myself with a curling iron, which hurt like hell, if this has ever happened to you. I immediately applied concentrate on the burn area and instead of blistering like my previous curling iron accidents, my skin was soothed. The area became brown in the next few days. After brown scab came off, my skin was fine and no mark at all. With prior curling iron accidents, I sometimes get light a light brown mark which would not disappear for a long time. In my La Mer adventure, I found out La Mer cream is great for bug bites, and concentrate is good for burn. 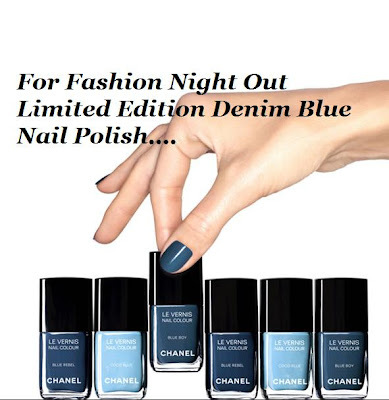 On the side note, I adore denim and this new Chanel nail color for Fashion Night Out is having my heart beating slightly faster. I can't wait to try it out tonight. Oh I needed that review! I'm eyeing the Concentrate for a long time! Ooh I'm keeping this on my list. I feel like I've heard so many rave reviews about La Mer products. The only thing that has kept me off is the price. Also I love the colors too! Thanks for the great review. I'll give La Mer a try. Wow that La Mer stuff sounds amazing! No surprise though given the price tag.